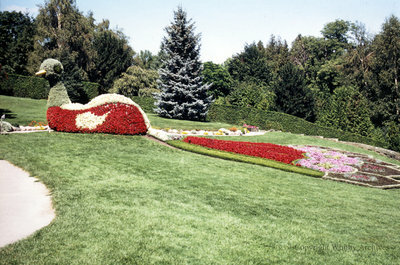 A colour photograph of a flower sculpture at Cullen Gardens and Miniature Village. According to Len Cullen's book "Dig About It... And Dung About It", the Peacock in this photograph is 17 feet tall and 40 feet long (see title link on right side of page). Cullen Gardens and Miniature Village, Date Unknown, Photographer Unknown. Whitby Archives A2013_042_028.